A number of recent studies have shown that when you eat the way humans did in prehistoric times, your health will improve. Author Ria Penders calls this diet “Paleo-nutrition” in her new book on organic food. What makes Paleo-nutrition better? Compared to the meat-and-potatoes and ‘fast food’ diets, Paleo-nutrition emphasizes pure natural raw foods. Proteins: Found in fish, meat, eggs, nuts and seeds, you need proteins for your immune system, and for muscles, intestines, skin, hair, and for energy. Have a portion at lunchtime and one in the evening and you will feel both more fit and better satisfied. Fat: Paleo-nutrition allows a great deal more fat than most popular diets. About 40-50% of the total amount of energy is supplied by fat. However, the amount of saturated fat is much less than in regular nutrition as your body doesn’t need much saturated fat. Poultry, meat, and fish of animals living in a natural environment contain predominantly omega-3-fatty acids. These fatty acids are important for your brain and skin, and for the regulatory systems in your body, for example, controlling inflammation and blood pressure. Carbohydrates: You need to derive about one third of the total amount of your energy from carbohydrates, although people who do more physical activities than average should eat larger portions of carbohydrates. Orthomolecular scientists advise you should avoid grains with gluten as they may do harm to your intestines. Grains like wheat and rye, fruit drinks and added sugars do not fit in a Paleo-nutrition diet. Vitamins and minerals: When you have two portions of vegetables and three portions of fruit daily, your intake of most vitamins and minerals will be higher than in regular nutrition. You should only be careful to obtain adequate amounts of calcium and iodine. Dairy products are not used in Paleo-nutrition but getting sufficient calcium does not need to be a problem if you eat a lot of vegetables, fruit, nuts and seeds. You will find iodine in seafood. 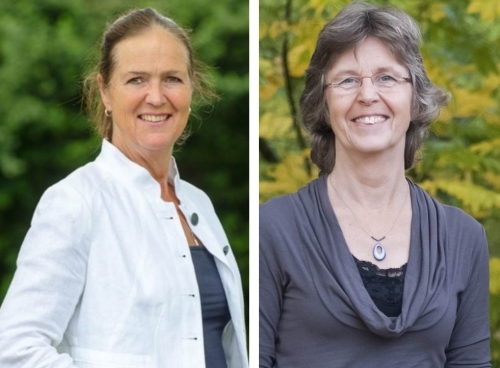 Co-authors Yvonne van Stigt (left) and Ria Penders (right) share their knowledge of Paleo-nutrition and orthomolecular science in a new book (published in Dutch, we have plans the book to be translated in English). Co-author Yvonne van Stigt, an orthomolecular therapist, while researching for her own health, came across The Paleo Diet written by Loren Cordain. It became clear to her that Paleo-nutrition was the solution both for her own health and for her clients. In 1967, Nobel Prize winning chemist Linus Pauling coined the word “orthomolecular” by adding the Greek prefix “ortho” meaning ‘correct’ or ‘right’ to molecular. His idea? The right molecules in the right amounts makes for a healthy body. In 1973, he founded the Institute for Orthomolecular Medicine (now the Linus Pauling Institute at the University of Oregon) to conduct research into, the relationships between health and disease, and the functions of micronutrients, phytochemicals vitamins, minerals, and other essentials in the human body. Orthomolecular and other scientific studies are now demonstrating that the prehistoric ‘hunter-gatherer’ diet of fresh foods gathered from Nature is probably the most beneficial way to eat. This book gives you practical ideas if you want to live and eat as we did thousands of years ago. prehistoric diet of fresh raw foods. For several generations, Penders family members have been fascinated by natural and organic ingredients. Recently, Ria Penders has come out with a new book simply called “Organic Food” (published in Dutch as “Oergondisch genieten”) with more than 250 healthy recipes based on a prehistoric diet. We should eat as people did thousands of years ago. People ate what was available in nature. Primitive man went out to hunt and fish. He picked up eggs and gathered fruits, vegetables, nuts, seeds and honey. The proteins and fats from fish and meat supplied most of their energy. The amount of carbohydrates in starch and sugars in the prehistoric diet was only about one third of the total amount of their energy intake. You can make the most delicious meals using only a few basic ingredients. 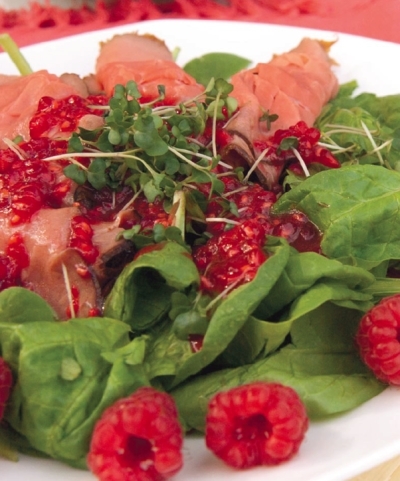 A salad of spinach and raspberries with cold roast beef make a super nutritious salad (doesn’t it look yummy in the photo?). Our ancestors’ diet avoids dairy and gluten found in certain grains and is low in saturated fat. Nowadays, many people eat processed food with a high percentage of refined carbohydrates, such as in bread, sweets and soft drinks. Processed food also contains salt, flavorings and preservatives… Carbohydrates supply most of the energy, about 70%. This nutrition does not satisfy; the appetite for food does not stop. Overweight and loss of energy lie ahead!